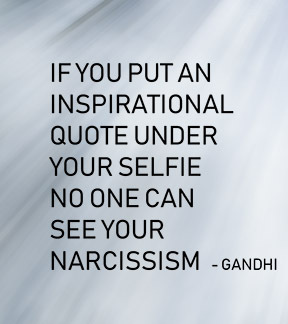 Are You Using Your Selfie Pole for Narcissism or Creative Growth? Has the selfie pole trend gotten out of hand and should we be so obsessed with self portraits? Ten years ago, it would have been considered self-centered, self-adoring, or perhaps even labeled narcissistic by many. Today it's accepted as normal behavior, but is this for the greater good or do selfie sticks have a negative effect on society in general. Selfie poles, also known as selfie monopods, cameras on a stick and camera extenders are a hot selling commodity in the world of camera accessories and social media sharing of our lives with anyone who will listen. There are several articles (see the links on the right) about all of the features and options available if you are looking to buy one. This article raises the issue of whether taking selfies is bad influential fad or a healthy trend for self-expression. 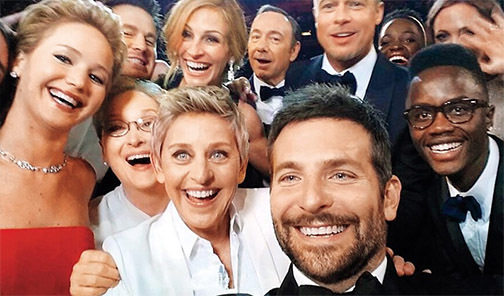 Bradley Cooper's now famous selfie, packed with the hottest movie stars, using Ellen DeGeneres' phone at the Oscars, gives us all justification to shoot selfies, right? Many commented that his arms weren't long enough to include everyone in the photo. Enter the solution: the selfie pole. Getting the extra distance between you and your subjects gives you the ability to include more in your photo. Is the obsession with taking a selfie a good or bad thing? Do these camera and smartphone accessories contribute to egocentric and self-centered behavior or are they a great photography tool to use? Let's take a closer look at some of benefits and some of the drawbacks of using camera extending poles to take selfies Here are two opposing views on this hot topic. 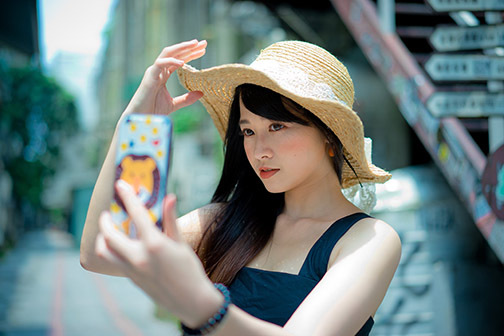 According to a few psychiatrists, such as Dr. David Veal, many patients who come for treatment of Body Dysmorphic Disorder, have a compulsion to take and post selfies on social media web sites. I personally wonder if the selfie is the cause of the disorder or simply a convenient behavior that is available to participate in with those affected. The degradation of quality portraits. With everyone, their friends, their sister, and their kid having a smart phone at their disposal, many people are taking poorly composed, poorly lit portraits instead of hiring a photographer who has a few of the skills and experience to create a pleasing photograph. The wrong focus. As a nature geek, I enjoy visiting and photographing many of our nation's natural treasures, The Redwoods and Sequoia forests, Yellowstone and Yosemite, Acadia national Park, Zion... you get the idea. The current trend - we get so focused on showing off that we visited one of these special places that we forget to truly enjoy being there. Many are so obsessed on sharing, perhaps bragging a bit, we take a photo of ourselves with the main attraction as an insignificant part of the background. Selfies can satisfy our need for self expression. Western civilization has been creating self portraits for centuries. Social media, Smart phones and camera extending arms are simply technology tools to be used for our convenience. Photography is a great way for us to connect as human beings. The emergence of digital photography and the internet has created the super-connected world. Photography is a universal language that can be understood by all nations and peoples. Many of the emotional issues arise out of bad decisions on how we use the technology, not the technology itself. We're blaming the invention of the selfie stick as the problem. What do you think? You can add your thoughts. Just make a brief comment here. Enter the iphone accessory, the CaseCam. Fans of the selfie, you've got options. No monopod, or pole required-it's a cell phone camera case that includes a clever mirror for taking those self portraits of you and your friends wherever you are: here is the link to the CaseCam on KickStarter.com. The CaseCam will have some limitations, particularly in situations where you don't have a convenient place to st your phone down, as well as situation where you want to shoot video and change the direction of your camera as you shoot. A good collapsible selfie pole also give you some new and fun creative ways to use a monopod. is it narcissistic to take selfie photos?